Notes: Haultepenne Castle also spelled Hautepenne Castle (French: Château de Hautepenne), located in Gleixhe in the town of Flémalle, is a part medieval, part renaissance structure. It is known for its red brick and uniquely shaped tower. 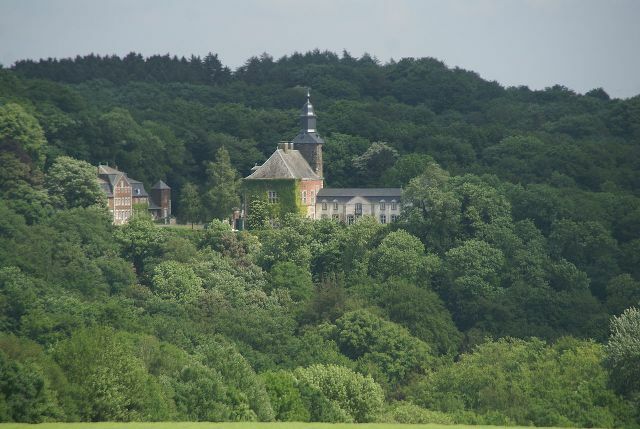 For several centuries, the castle was in the possession of a Flemish noble family, Berlaymont. The name of the castle is bound to the sobriquet, the Fury of Haultepenne, when the army of Claude de Berlaymont (1550-1586) overran the Breda following a siege in 1581. The city surrendered on the condition that it would not be sacked, and when the fighting stopped, the soldiers were turned lose. Over 500 residents died.